Uncoated weathering steel (UWS) bridges have been in use in the United States for nearly 50 years, now enabling the long-term performance of these structures to be assessed and the current FHWA technical advisory on use of UWS in highway bridges to be revisited. (1) Such an assessment is the focus of research being conducted through the Long-Term Bridge Performance (LTBP) Program by researchers at the University of Delaware’s Center for Innovative Bridge Engineering, where the overall goal is to develop quantitative recommendations for updating the existing technical advisory. To date, the research has consisted of three primary avenues: surveys of bridge owners, creation and statistical analysis of the performance of a national UWS database, and field evaluations of selected bridges. This survey was completed during phase 1 of the project. The project is currently in phase 2, during which the database has been created and field work is ongoing. Through a survey sent to all LTBP State coordinators, data have been compiled on the historical use of UWS throughout the United States, owners’ perceptions on the performance of UWS, and the conditions under which poor overall performance was observed. The results of this survey have revealed that all but six State transportation departments (Alaska, Georgia, Hawaii, Michigan, Mississippi, and Puerto Rico) presently construct UWS bridges, indicating the widespread use of this material and value of future research on this topic. The owners’ perception of UWS performance within their agencies are summarized by figure 1, in which the agencies not reporting data for this question (New Jersey and Hawaii) are filled with a dashed pattern. This data indicate that 96 percent of the respondents have a positive perception of the performance of UWS, but 40 percent of these respondents reported some drawback to UWS performance, typically associated with various specific environments or situations and indicating the potential for developing best practices with regards to the use of UWS. The drawbacks/problematic environments most often related to the use of deicing agents on roadways beneath overpasses where the overpasses used unpainted weathering steel for their girders. The two states with a negative perception of UWS were Michigan and Alaska, neither of which has constructed UWS bridges since the UWS technical advisory was published in 1989. Figure 1. Illustration. Owners' perception of the performance of UWS within their agency. Figure 2. Graph. Comparison of SCR versus age trendlines for UWS and OS Bridges. The latitudes and longitudes recorded for each of these structures in the NBI have also been used to create a GIS database of the nearly 10,000 UWS structures that have been identified. In addition, climate data (monthly humidity values, annual snowfall amounts, etc.) and atmospheric chemical concentration data have also been added to the GIS database such that the specific climate of each UWS bridge is now known. This information can be used in future research to assess specific correlations between environmental parameters and bridge condition. Through this effort, it is envisioned that environments of concern for using UWS can be more quantitatively identified on a national basis. Field evaluations (see figure 3) assess the efficacy of simple evaluation methods that may be able to be conveniently adopted as a part of long-term monitoring efforts within the LTBP Program. These methods include (1) clear tape adhesion tests, which can be analyzed using digital image processing to calculate average sizes and spatial densities of corrosion products, and (2) collection of corrosion products for later laboratory ion chromatography and X-ray diffraction analysis to determine soluble salt concentrations and proportions of the various ferrous oxyhydroxides that form on weathering steel. Knowing the composition of the rust helps to distinguish if the adherent patina formed, or if excessive corrosion product formed (most likely from excessive wetness or chlorides). These methods have been piloted on bridges that have been selected using a rigorous statistical process that identifies bridges with a broad range of performance within a 50-mi radius, where performance is assessed relative to the environment of the bridge, as determined using the UWS GIS database discussed above. As a result of these efforts, the suitability of simple testing methods for more widespread use will be assessed. Additionally, this work serves as a more refined assessment in order to validate or refute the performance trends observed based on the statistical analyses conducted in other aspects of this work. Figure 3. Photo. Field evaluation of representative UWS bridge. As phase 2 of this project concludes, the GIS database will provide significant opportunities for further assessing UWS performance as a function of different parameters, particularly climate and environmental variables, in future phases of this effort such that guidance on environments suitable for UWS can become more quantitative. Furthermore, additional field work anticipated for phase 3 of this project will provide additional data to either confirm or refute the cause and effect relationships suggested by the data with regards to potential quantitative factors causing inferior performance of UWS bridges. Since the 1970s, the number of pretensioned and post-tensioned (PT) concrete bridges has increased steadily. For PT bridges, the steel PT tendons (a group of seven-wire steel strands) are located in a duct and surrounded by a protective grout. The grout functions as the last layer of defense against corrosion in two ways: by providing a high pH environment to form a protective oxide film on the strand surface, and by being a physical barrier to water, oxygen, and chloride ions. Corrosion of strands initiates when the protective oxide film is compromised due to chloride attack or carbonation of the surrounding grout upon exposure to water and air. Once corrosion starts, it propagates at a certain rate controlled by many factors such as oxygen availability, moisture content, electrical resistance, grout pH, and chloride concentration. A recent discovery of a grout product with elevated levels of chloride used in a PT concrete straddle cap located in Corpus Christi, TX, resulted in a full investigation of potential corrosion problems. (4, 5) This discovery triggered a follow-up investigation by the grout manufacturer, and the investigation determined that the prebagged grout used in this project had chloride levels exceeding the specified limit (0.08-percent chloride by weight of cement). It was also discovered that this prebagged grout product produced at a certain plant contained varying levels of chloride. These levels exceed current limits set by all of the domestic and international regulatory committees. However, the literature reported limited information pertaining to the actual minimum chloride concentration to induce corrosion, or chloride threshold, of seven-wire PT strands. Therefore, Federal Highway Administration (FHWA) sponsored a 6-month accelerated laboratory corrosion testing program to determine chloride thresholds of PT strands exposed to chloride-contaminated grout. The study, titled “Determination of Chloride Thresholds for Post-Tensioned Tendons Exposed to Normal Grout,” determined two chloride threshold values for the PT strands fully encased in normal grout. The first threshold is 0.4-percent chloride concentration by weight of cement, which is the lowest amount to initiate corrosion of strands. At this threshold, rust spots can be formed, and a small number of pits begin to form beneath some of the rust spots. The second “critical” chloride threshold is 0.8-percent chloride by weight of cement in association with corrosion propagation. At this threshold, corrosion starts to intensify in terms of number of pits and pit depth. Once chloride concentration exceeds the “critical” threshold, significant corrosion damage can be anticipated, and structural integrity of PT bridges could be compromised in near future. If PT ducts contain carbonated, segregated grout; duct cracks; grout voids filled with water with or without chloride ions; and free sulfate ions in contact with the strands, then corrosion could start below the proposed threshold values. Figure 4. Photo. Pitting corrosion on a 0.4-percent chloride concentration single strand specimen. Figure 5. Photo. Pitting corrosion on a 0.8-percent chloride concentration single strand specimens. On November 12, 2013, FHWA issued Technical Advisory (TA) T 5140.33, “Recommendations for Assessing and Managing the Long-Term Performance of Post-Tensioned Bridges Having Tendons Installed with Grout Containing Elevated Levels of Chloride.” (6) The TA provides detailed recommendations for bridge owners to address elevated levels of chloride discovered in a commercially available, prebagged grout product made for PT tendons. In short, this guidance uses a five-step process to determine corrosion risk level and the associated follow-up actions, if any. The TA relies in part on research results produced at the Turner-Fairbank Highway Research Center (TFHRC) and was coordinated with a group of State transportation departments who own structures that are likely affected, and industry. TFHRC was able to reprioritize activities in order to plan and execute the supporting research in a timeframe that was appropriately responsive to the need. FHWA Contacts: Paul Virmani, HRDI-60, 202-493-3052, paul.virmani@dot.gov; Hamid Ghasemi, HRDI-60, 202-493-3042, hamid.ghasemi@dot.gov; and Reggie Holt, HIBT-10, 202-366-4596, reggie.holt@dot.gov. FHWA’s LTBP Program held a workshop at the 93rd annual Transportation Research Board (TRB) meeting in January 2014. It began with positive comments from Deputy Secretary of Transportation Victor Mendez and followed with presentations on the RABIT™ Bridge Deck Assessment Tool and its use for data collection and many other topics. These presentations are now available online: https://www.fhwa.dot.gov/research/tfhrc/programs/infrastructure/structures/ltbp/pubs.cfm. Two new FHWA publications, the LTBP Bridge Performance Primer Report and associated executive summary (known as a TechBrief), are now available. The report (publication no. FHWA-HRT-13-051) can be found online: https://www.fhwa.dot.gov/publications/research/infrastructure/structures/ltbp/13051/index.cfm. The report explains bridge performance through aspects that have the most impact on the bridge’s ability to serve its intended purpose safely and efficiently, and explores how bridge owners can measure and report that performance and address these critical issues. The TechBrief can be found online: https://www.fhwa.dot.gov/publications/research/infrastructure/structures/ltbp/14032/index.cfm. Bridge research is beginning in two areas as a result of two new contracts. 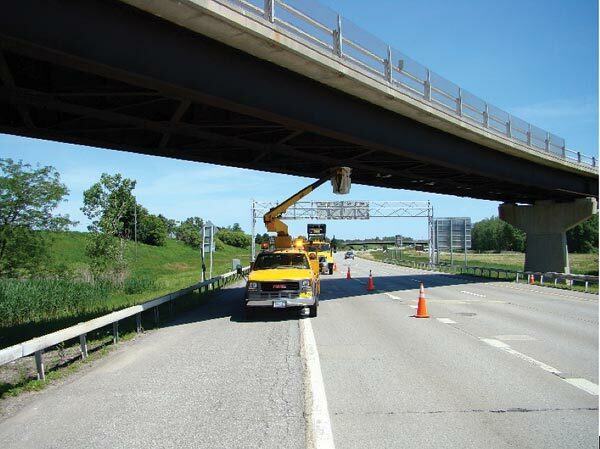 Pennoni Associates, Inc., is undertaking work to develop and validate a numerical model for a bridge condition index. The research began in September 2013 and involves an extensive literature review; development of a data-driven, risk-based model; and validation of this model. The 3-year research study will culminate with implementation of the validated model in the LTBP Bridge Portal (the LTBP Program’s repository of data and forecasting tools). Research is also beginning on a study to develop a quantitative bridge traffic database. The effort is part of a 5-year “Technical Assistance” task order also signed with Pennoni Associates, Inc., in September 2013. Preliminary research for the quantitative bridge traffic database includes evaluations of ways to acquire data, interviews with stakeholders about lessons learned in collecting truck and traffic data, protocols for installation, calibration and operation of equipment, and actual data collection. For more information, contact Sue Lane at 202-493-3151 and susan.lane@dot.gov. U.S. Department of Transportation, “Uncoated Weathering Steel in Structures,” Technical Advisory 5140.22, Federal Highway Administration, Washington, DC, October 1989. McConnell, J., Shenton, H., Mertz, D., and Kaur, D., “Performance of Uncoated Weathering Steel Highway Bridges throughout the United States,” Proceedings of the 2014 Transportation Research Board Annual Meeting, Washington, DC, January 2014. McConnell, J., Shenton, H., Mertz, D., and Kaur, D., “National Review on Use and Performance of Uncoated Weathering Steel Highway Bridges,” Journal of Bridge Engineering, in press, 2014. Merrill, B.D., “Memorandum—Grout Testing and Analysis of Carbon Plant Road over IH 37,” Texas Department of Transportation, September 2010. Kelly, P.L., consultant presentation slides for “Grout Investigation Update,” Simpson Gumpertz & Heger, October 2011. U.S. Department of Transportation, “Recommendations for Assessing and Managing the Long-Term Performance of Post-Tensioned Bridges Having Tendons Installed with Grout Containing Elevated Levels of Chloride,” Technical Advisory T 5140.33, Federal Highway Administration, Washington, DC, November 2013.